Greetings From Our Solar Powered Office: What a summer it was! Too short, as always—but with some beneficial rains that helped with the forest fires. Then, we had unusually hot weather in September, and a nasty cold snap early in October. Still, the orchard and garden were very generous to us and our friends, with much cider, plums, potatoes, carrots and other produce to share. To assist your information input, we’ve tried to develop as much on-line information as we can. For solar water pumping, see www.PVsolarpumps.com; for utility-tied photovoltaic systems, visit www.grid-tie.com; for efficient AC appliances, DC ’fridges, coolers and freezers see www.eco-fridge.com; for natural and LP gas appliances, see www.LPappliances.com. Our main index page is www.oasismontana.com and we now offer composting toilets at www.eco-potty.com. Visit our web pages and stay a while! 30% FEDERAL TAX CREDIT —and reduced solar module pricing make this the ideal time to get your PV system up and running! Solar modules have come down as much as 30% in the past year, so check our pricing page for what modules best suit your power project (or give us a call). Since the paperwork involving these incentives can be a little confusing, peruse these online sources for more information. http://www.dsireusa.org for a state-by-state database of all incentives available to U.S. consumers. http://www.energy.gov/media/HR_1424.pdf This link summarizes the energy tax incentives of the Emergency Economic Stabilization Act of 2008.
http://www.energystar.gov/index.cfm?c=tax_credits.tx_index This lists federal tax credits for energy efficiency. http://www.awea.org/legislative/american_recovery_reinvestment_act.html This site summarizes grant programs and wind energy productions tax credits, as well as tax credits for advanced energy manufacturers. And here’s http://www.irs.gov/pub/irs-pdf/f5695.pdf , the form for the personal residential tax credit. The Allure of Wind Power! Many people are enamored with the prospect of wind power generation—and unfortunately some make the investment before they have really ascertained that they have the resource for a wind system. Solar modules are so boring, they just sit there….but wind machines are a form of kinetic sculpture, and their spinning movement is quite entrancing! BUT, while folks are drawn to wind generation, photovoltaics are often a better approach (often because wind looks like it’s doing something even when it isn’t, while PV tends to be the opposite). And there are important issues with wind turbines; wind devices need proper siting to avoid turbulence, and most neighborhoods have tower restrictions. Wind generators should be mounted at least 30 ft. above anything else within 500 ft., and in an urban situation, usually your lot must be at least 1/2 half acre or larger in size. Permits, neighbors, variances….all are factors to be considered before spending money on a wind generator. The larger the blade span, the greater the swept wind area, so if you do have an excellent site for wind power, go big and high for the greatest power return. http://www.urbanturbines.org (there’s some scary pictures here!). A pole stuck 10 ft. above your garage is not going to generate much; now I’m not saying you can’t have a wind turbine in the city limits, but unless you have good clean wind, preferably mostly from one direction, with no obstacles to reduce the wind resource, it’s not going to be a good investment. http://www.nrel.gov/wind/resource_assessment.html and http://www.windpoweringamerica.gov/wind_maps.asp. You may also want to consult with your local weather resources and airports—always good places to check for average wind speeds. Call for availability, freight costs, and quantities (# of modules) on pallets for the best deal. You can’t get less than a pallet quantity to get the pallet ‘deal’. For larger modules, pallet quantity generally runs between 20 and 30 modules. Call for single module and pallet quantity prices. Sharp NE-170UI, 170W SALE! while supplies last. We offer a variety of mounts to suit your project, including A-frame roof or ground mounts, top and side of pole mounts, flush mounts, tilt mounts, RV racks, as well as Zomeworks or Wattsun Trackers. Call for your cost, avail-ability and freight. At this writing, some racks may have a 6 week lead time. CHARGE CONTROLLERS—call for information! We offer most models, including those made by Morningstar, Blue Sky Energy, Apollo Solar, Xantrex, Outback Power, SCI and Stecca. http://www.plantservices.com/wp_downloads/pdf/0903_Power_Quality.pdf. As quoted: "The problem is that some of these solution providers have significantly overstated the savings and the customers are deceived. They often provide very little, if any, energy savings." Propane refrigerators, freezers, ranges, cooktops - www.LPappliances.com for information. 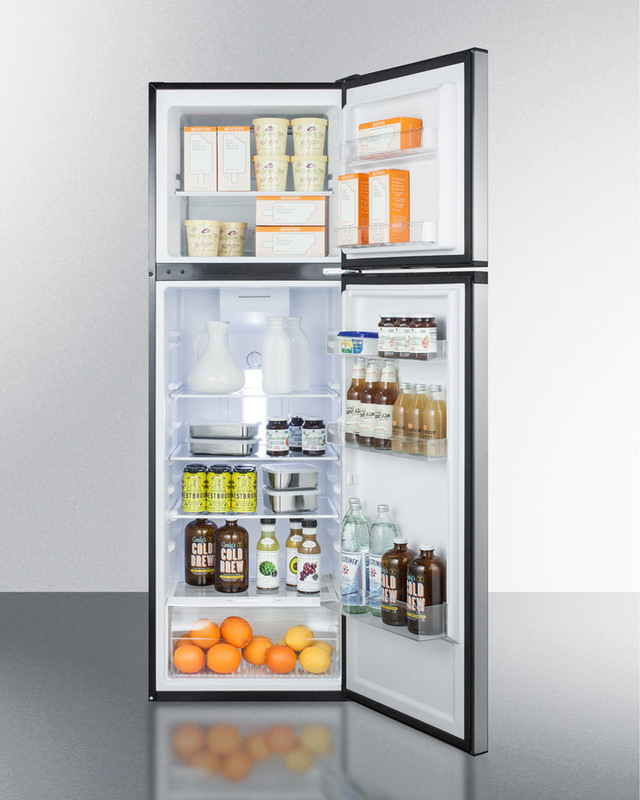 No power is no problem with these gas ‘fridges, freezers and stoves! The refrigerators and freezer come set up for propane but can be converted to natural gas for a small fee. The stoves and cooktops come set up for natural gas with instructions to adjust for use with propane. 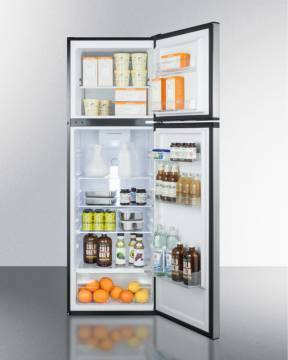 Dometic Servel propane refrigerator, 8 cu.ft. capacity Call for pricing. The Servel propane refrigerator can be converted to use natural gas; call for pricing. Crystal Cold 12 cu.ft. capacity propane ’fridge Call for pricing. Crystal Cold 15 cu.ft. capacity Call for pricing. Crystal Cold 18 cu.ft. capacity Call for pricing. Stainless 18 cu.ft. capacity (w/ black textured sides) Call for pricing. NEW 21 cu.ft. capacity White Crystal Cold ‘Fridge Call for pricing. Also available as a special order is a 19 cu.ft. black model for Call for pricing. 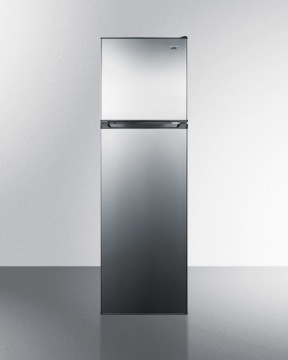 The Crystal Cold refrigerators can be converted to natural gas; call for pricing. Blizzard 15 cu.ft. capacity upright freezer Call for pricing. Blizzard 22 cu.ft. capacity upright freezer Call for pricing. The Blizzard 15 and 22 cu.ft. freezers can be converted to natural gas; call for pricing. Peerless Premier gas ranges are available in 20”, 24”, 30” and 36” widths, with model colors ranging from white, bisque, black and stainless. Even the electronic ignition models will work without power (you can light the burners and oven with a match) -- there’s no glow bar in the ovens on these mechanically simple, American-made stoves. All ranges are set up for natural gas but LP conversion kits are included for every model at no extra cost (and you don’t have to be Mr. Wizard to figure it out). We also offer propane & natural gas cooktops, Italian-made by Verona; these professional cooking appliances are available in a wide variety of finishes (stainless, black, bisque and white or black glass), with two, four and five burner models. www.LPappliances.com for pictures and specifications. Sealed inverters: FX2012T, 2524T, 3048T Call for pricing. Vented inverters: VFX2812, 3524, 3648 Call for pricing. Grid-tie, mobile, marine and export versions available on most of these sine wave inverters. MATE system display & controller Call for pricing. PSX240 Transformer Call for pricing. Communications Manager HUB-4; HUB-10 Call for pricing. FLEXmax60 MPPT 60A Charge Controller Call for pricing. FLEXmax80 MPPT 80A Controller Call for pricing. There are way more Outback Power products than we have room to list….call or e-mail for more information. info@oasismontana.com or visit their web page at www.outbackpower.com They’ve got a nice product catalog there you can download too, at http://www.outbackpower.com/catalog.htm. Chris Daum, owner and manager of Oasis Montana, has been in the renewable energy field for 20 years. We are happy to work with your installer, electrician, or contractor out of our area, and we do install systems locally. We provide detailed wiring diagrams with the systems we sell. We are a small shop and take the time to design a system specific solar electric power system to your requirements. 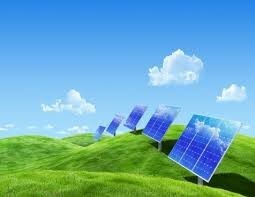 We do not sell solar electric power "kits". Every system is specifically designed to meet your needs. Being a small shop with over 20 years experience we are able to specialize in great customer service. There are a lot of "newbees" out there now that "Renewable Energy" is starting to be popular. Buy from Oasis Montana Inc with confidence and don't be fooled by some "Johnny-come-lately" now that renewable energy is becoming in vogue. TO PLACE AN ORDER: E-mail or call us for your freight ; if you have any questions about your system or product, please contact us. E-mail is easiest and fastest (but we know that you aren’t all on line). We accept Visa/Mastercard (personal and business checks are fine). For our international customers, we accept bank transfers—e-mail or call us for our banking information. Our hours are 8:30 am to 4:00 pm Mountain Time, Mon. – Fri. If we‘re on another line when you call, please leave us a message, and we’ll get back to you as soon as we can, but you may have to leave a message if we’re with a customer or on one of the other lines. 406-777-4321 or 4309 or e-mail us at info@oasismontana.com — for tech support on renewable energy systems, e-mail larry@oasismontana.com. We’d be very happy to help you with your power project — send an e-mail or give us a call! 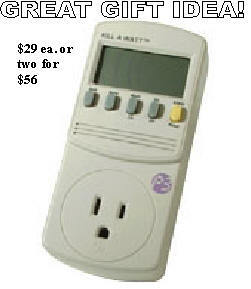 The Electricity Detector and Monitor can educate you about your monthly electric bill and help you save a lot of money. You can now be a ’detective’ and ascertain what appliances are actually worth keeping plugged in. Simply plug in the Kill A Watt meter, connect your appliances to it and Kill a Watt will assess how efficient it really is, showing you the instantaneous power used, and also cumulative energy or kilowatt-hours used. Kill a Watt, with large LCD display, will count consumption by the kilowatt-hour, same as your local utility. With the help of Kill a Watt you can figure out your electrical expenses by the day, week, month or year on a given device. Kill a Watt can check the quality of your power by monitoring Voltage, Line Frequency, and Power Factor. Still just $25. Now you'll know if it is time to install a power strip on your entertainment center instead of feeding those ghosts loads while you are sleeping or away from home. Or, is that laptop really cheaper to power than a desktop PC? The CHINOOK 200 Wind Turbine is here! 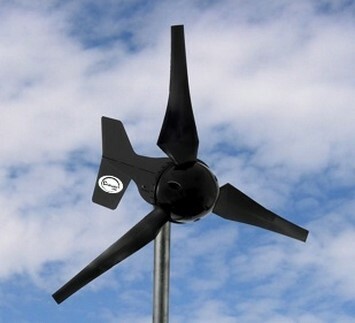 If you have modest power requirements, good average wind speeds and are looking for a small wind generator to help keep your batteries full (especially in the cold, dark days of winter), consider the Chinook turbine. Its maximum output is 250W and it’s rated at 200W, at either 12V or 24V output. It is made and tested in one of Montana’s windiest location (near Great Falls). At an average wind speed of 12 mph you will get about 40 kilowatt-hours per month (depending on your elevation and constancy of wind). Ideal for supplementing solar electric power systems! The DL300 Series controller is designed to prevent your batteries from overcharging; it’s compact and easy to install, and incorporates a 300W resistor/heater and controller in a stout 18 gauge powder-coated steel enclosure. If you have been considering the addition of wind to your PV system—or you are planning to add a wind generator to your sail-boat or catamaran, now is the time to try a Chinook! The turbine and controller is $675 plus freight. The next batch in production should be ready to ship just before Thanksgiving. We have specs and a copy of the manual we can e-mail, if you want more information! While it is wonderful that our federal government has finally stepped up to the plate with its renewable tax incentives, there are always unscrupulous persons waiting to take advantage of people’s interest in these kinds of power systems. There was an article in AARP’s last newsletter about the dangers of scammers, and how you can avoid them at http://bulletin.aarp.org/yourmoney/scamalert/articles/scam_alert_watch_out_for_energy_saving_schemes.html. There are other scammers out there too; of late there’ve been many e-mails about ’making your own solar modules’ with claims of ’powering your home for a $200 investment’. While there are kits to build your own modules, they are better suited for the student or hobby endeavor. 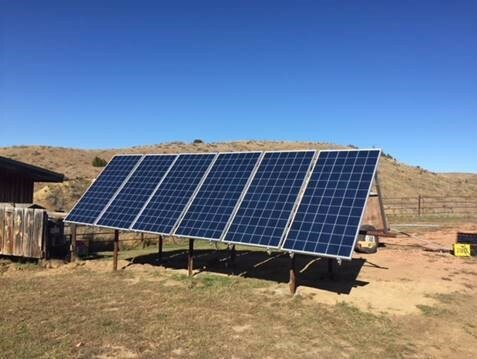 We are getting calls from folks wanting to sell power back to their utility with their home-made solar modules or wind generators. Unfortunately most people are clueless as to the input requirement for these grid-tie inverters, and it’s a rude awakening when they are told that only UL approved components are legal and National Electric Code safe for grid-tie systems. And if you think that $200 of home-made PV panels will power the average home, there’s a bridge somewhere that’s for sale cheap too…. Durable! Units used and tested for 18 years are still going strong. 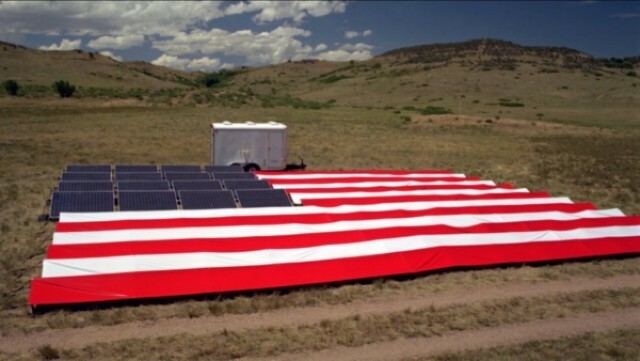 No fuel or electricity needed, so it can be placed anywhere in un-obscured sunlight. No risk of electrical shock to livestock, with a shatter-proof passive solar collector. No costly fuel or electricity; uses energy from the sun, still absorbs UV on cloudy days. SAVES time and money, so it pays for itself faster. Will NOT freeze even when livestock don't drink. Easy accessible water for livestock, even in ice and snow conditions. There’s no minimum number of livestock needed, and this also keeps water cool and algae-free in summer. Closed system helps stop West Nile Virus and other diseases. You may have to fence out the collector side to avoid shading from stock. The 42 gallon unit is guaranteed to -50F degrees below zero, and the 25 gallon unit guaranteed to -20 degrees below zero -- during winter conditions with wind chill factor included. Pee fuel….it could make beer drinking even more important! Decisions, decisions...should you subsidize your utility company’s photovoltaic project, or is it more cost-effective to renovate your own home with PV? http://www.emagazine.com/view/?4802, and scroll down for some perspectives and answers. Intermittency Not a Problem for Wind Power, Say European Studies: http://www.edie.net/news/news_story.asp?src=nl&id=16703; reports published in the past month by the National Grid, and other energy consultancies, all come to the same conclusion - that large scale deployment of wind energy does away with the problems of variable wind. The NGO report, "Managing Variability," published by WWF, RSPB, Greenpeace and Friends of the Earth, also claims that breakdowns in coal and gas plants generally pose more of a threat to the stability of utility networks than the relatively benign variations in the output of wind plant. New Economic Data Released on Clean Energy Legislation: http://www.nrdc.org/media/2009/090917.asp Under the American Clean Energy and Security Act, there will be more jobs, less global warming pollution and greater security, all for less than the cost of a postage stamp a day (per American household), according to “A Clean Energy Bargain” analysis. 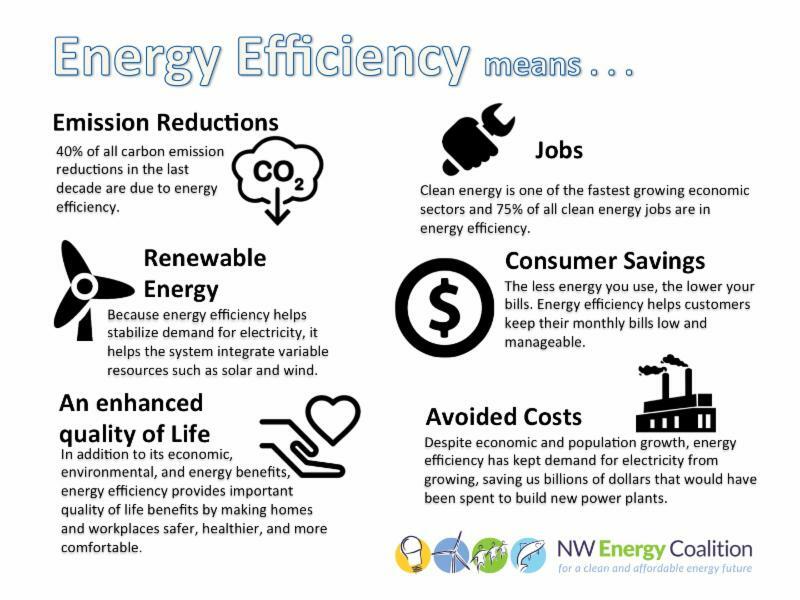 The report found that ACES will drive investments in clean energy and energy efficiency of more than $300 billion by 2030. WE’RE STILL REDUCING OUR MAILING LIST—with rising printing & mailing costs, we will be removing some old addresses from our mailing list. If you receive both this e-mail version and the paper version, let us know if we can remove your name from our mailed version if this version works for you. If you are reading this from our web site and would like to subscribe to our emailed newsletter please let us know. It saves paper, labor and postage, and only disturbs a few electrons. Sometimes we have a great deal to offer, or just some good RE news to pass on. We do not sell or share our (small, hand-maintained) e-mail list with anyone. Contact us at info@oasismontana.com. If we have a sale or new product, e-mail may be your only notification. And we promise we won’t bother you more than a couple of times a year.